Geneva Bible. The Bible that Changed the World. 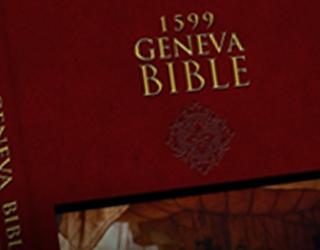 Watch the history of the Geneva Bible unfold before your eyes and see why this important Bible translation was brought back into print after 400 years! 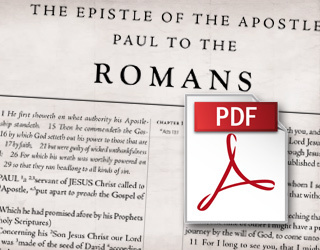 Read the book of Romans in PDF format! Or listen to the first chapter of Romans in MP3 format. Compare the original 1599 edition and the new, restored editions. When the Pilgrims arrived in the New World in 1620, they brought along supplies, a consuming passion for advancing the Kingdom of Christ, and the Word of God. Clearly, their most precious cargo was the Bible – specifically, the 1599 Geneva Bible. All but forgotten in our day, this version of the Bible was the most widely read and influential English Bible of the sixteenth and seventeenth centuries. A superb translation, it was the product of the best Protestant scholars of the day and became the Bible of choice for many of the greatest writers and thinkers of that time. Men such as William Shakespeare, John Bunyan, and John Milton used the Geneva Bible in their writings. William Bradford also cited the Geneva Bible in his famous book Of Plymouth Plantation. Tolle Lege Press is pleased to announce the release of a beautiful new edition of the historic 1599 Geneva Bible. Check out the links on the right to learn how you can own and experience the Bible that the Pilgrims brought to America on the Mayflower! Tolle Lege Press is pleased to announce the release of a beautiful new edition of the historic 1599 Geneva Bible. Check out the links throughout this website to learn how you can own and experience the Bible that the Pilgrims brought to America on the Mayflower.